The residents of Eagle, Star, and the rest of western Ada County love the wide-open and pastoral character where they live— and hate it when that aesthetic is wrecked with litter, like the 147 old junk tires left strewn off Beacon Light Road last night. The number 147 is not a misprint or typo. Someone decided to drive down Beacon Light road, between Eagle Road and Idaho 16, and dump old tires on the side of the road for over 3 miles. Every one of those tires was a potential traffic and safety hazard. Some still had metal rims attached. The tires were spaced out all along the road, making each one a potential crime. 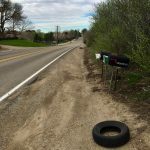 Every tire dumped in Eagle could result in separate misdemeanor charge – distributing or scattering garbage — which is punishable by up to six months in jail and a $1,000 fine. 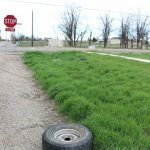 Every tire found in unincorporated Ada County could result in a separate infraction for placing debris on public property, which is punishable by up a $300 fine and up to 10 days in jail. 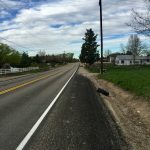 You can also add in the cost of restitution for the Ada County Highway District, which had to remove and safely dispose of the tires. Whoever dumped the tires committed a crime and is being incredibly terrible stewards of the land. Please know if you dump trash, we will work hard to find you. That’s why it would be best if whoever did this contacted Eagle Police or the Ada County Sheriff’s Office now. Deputies are actively investigating this and would like to hear from anyone who saw a truck carrying tires on Beacon Light Road late Thursday night or early Friday morning.